I recently bought a new set of pencils. For a little while now I have been struggling with the work I was creating. My old ways of working were not working for me anymore and I was feeling restricted. I suppose it's quite obvious to say you should create work that you want to create but it took a little while for that to become apparent to me. I guess I didn't know how to transition, nor was I fully sure what the work was that I wanted to be creating. I was worried about the outside look rather than what was going on inside me. But, after this ~epiphany~ I decided to follow my bliss and see where it leads me. And I bought a new set of pencils. Faber Castell Polychromos pencils to be exact. I saw a photoshoot for an eyewear line by Leith Clark with Warby Parker and it was right up my street. I loved the 60s styling and collars on the clothing. I decided to use the images to test out my new equipment. The model is actress/writer Zoe Kazan. I've seen her in Happythankyoumoreplease, The Pretty One and Ruby Sparks which she also wrote. I really like her as an actress and I was really pleasantly surprised by Ruby Sparks. 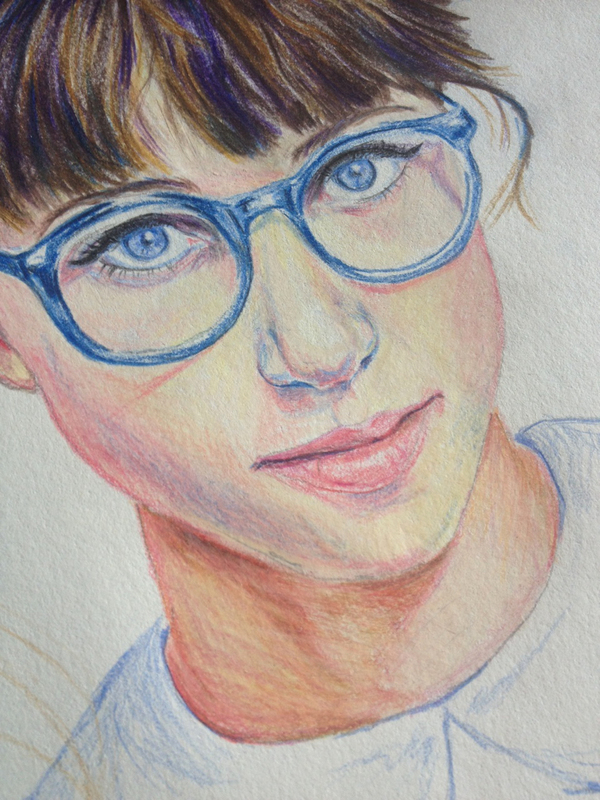 So it was nice to draw someone I think is cool (she favourited this on twitter which is also cool). For a moment lets talk about pencils. I know it seems odd to talk about pencils. I mean colouring pencils are colouring pencils right? Like kids use them. But once you get into the big leagues (yes, the big league of pencils) you're looking at about £40 for 30/35. Getting a good set that's going to last is important. For those interested the pencils have been perfect. They are well made, all centered and the lead is fixed to the wood so even if the lead breaks it's still held in place. The colours are vibrant and mix really well. I've been mixing them with Derwent Coloursoft and it smoothes the colours in nicely. Even outside this little story of creating artwork I think we do find ourselves feeling like we have to continue on doing the same thing. We have to have the same style, be it clothing, music, writing, art. I think it can be very freeing to give that up and decide to like and do what makes you happy. I've found it very comforting and for the most part decision making becomes simple. I am excited to do what I feel like doing. And to let go of the worry of how this will all fit. Have you ever felt a similar need for a change?